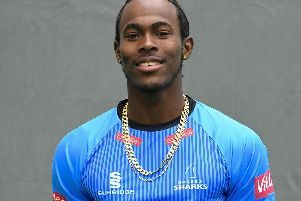 Jofra Archer and Chris Jordan are included in the Sussex Sharks squad for the fixture against Surrey at the Kia Oval on Tuesday. Luke Wright returns to the 13-man group having recovered from a minor hip injury that kept him out of the defeat to Middlesex and the abandoned game against Gloucestershire. If he is selected, the Surrey game will be Jordan’s first appearance for Sussex this season. The all-rounder was a non-playing member of the Sunrisers Hyderabad side that lost in Sunday’s IPL final. Jofra Archer – who returned from the IPL after his Rajasthan Royals were eliminated last Wednesday - had been set for his first appearance at Bristol on Sunday, but a freak thunderstorm washed out the match before a ball was bowled. The Sharks took a point from that ‘no result’ and sit in fifth position with five points after five matches in the South Group. Surrey, having played one game less, are in eighth position with four points. After a slow start, Surrey have won their previous two matches against Gloucestershire and Essex respectively.